A Satisfactory rating requires acceptable student evaluations of classes over the period of review. The following charts and table show a summary of my course evaluation scores by question and overall (with 95% confidence intervals determined using an approximate sample size for each course of n=30 students). This summary information indicates that 1) my course evaluation scores have been consistently high overall, at or above departmental averages, 2) lower scores correspond to semesters in which I made substantial changes to my course organization and delivery mechanisms (Spring 2012, all courses and Spring 2013, all non-Honors courses), and 3) the trend indicates continuous improvement, in particular over the past academic year, when I feel I’ve really converged to a nice fit between my priorities, teaching style, and ability to create value for students. Top scores across all semesters were for #6 (shows concern and respect; mean 4.57), #5 (acknowledges all questions; mean 4.5), and #9 (fair and impartial; mean 4.42). 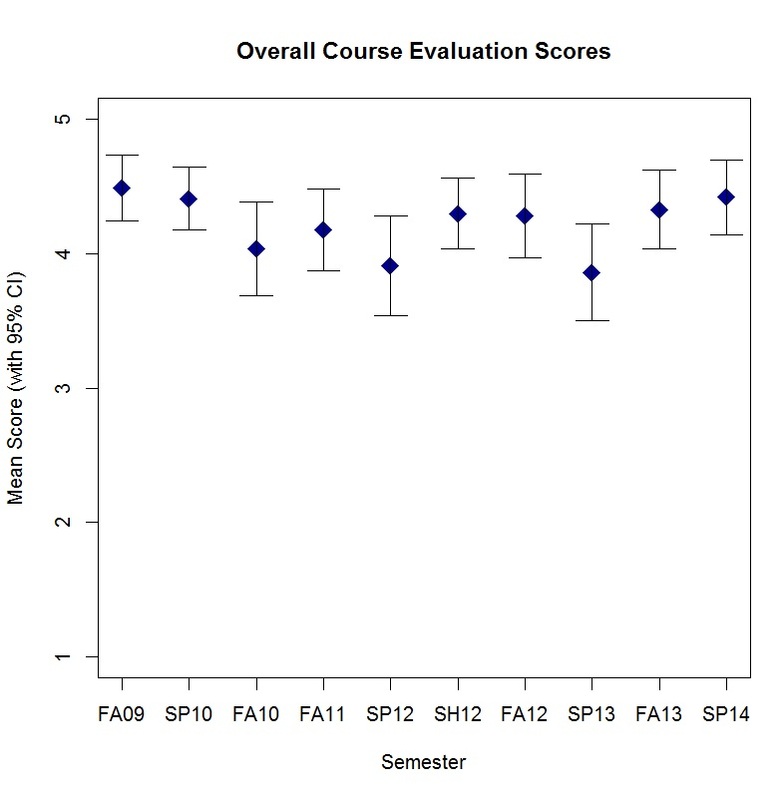 Lowest scores across all semesters were for #13 (value of textbook; mean 3.68), #1 (excellent course overall; mean 3.89), and #22 (labs were interesting; mean 4.02). Over the most recent academic year, the scores for #13 (value of textbook) continued to be low with a mean of 3.77, but new textbooks have been selected for all 2014-2015 courses which should help to resolve this deficiency. Means for #1 (excellent course overall; 4.15) and #22 (labs are interesting; 4.35) have risen significantly over the most recent academic year. A listing all of the means by question from semester to semester is provided in the table below. Notes: “SH12” represents scores for the new Honors course that I co-developed and offered in the Spring of 2012, which was evaluated through the College of Business and did not appear on my departmental evaluations. No evaluations for any courses were available for Spring 2011.